Since early recorded history, people have been harnessing the energy of the wind. Wind energy propelled boats along the Nile River as early as 5000 B.C. By 200 B.C., simple windmills in China were pumping water, while vertical-axis windmills with woven reed sails were grinding grain in Persia and the Middle East. 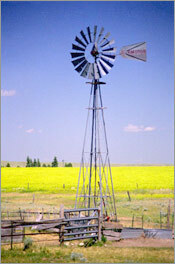 Early in the twentieth century, windmills were commonly used across the Great Plains to pump water and to generate electricity. New ways of using the energy of the wind eventually spread around the world. By the 11th century, people in the Middle East were using windmills extensively for food production; returning merchants and crusaders carried this idea back to Europe. The Dutch refined the windmill and adapted it for draining lakes and marshes in the Rhine River Delta. When settlers took this technology to the New World in the late 19th century, they began using windmills to pump water for farms and ranches, and later, to generate electricity for homes and industry. Industrialization, first in Europe and later in America, led to a gradual decline in the use of windmills. The steam engine replaced European water-pumping windmills. In the 1930s, the Rural Electrification Administration's programs brought inexpensive electric power to most rural areas in the United States. However, industrialization also sparked the development of larger windmills to generate electricity. Commonly called wind turbines, these machines appeared in Denmark as early as 1890. In the 1940s the largest wind turbine of the time began operating on a Vermont hilltop known as Grandpa's Knob. This turbine, rated at 1.25 megawatts in winds of about 30 mph, fed electric power to the local utility network for several months during World War II. The popularity of using the energy in the wind has always fluctuated with the price of fossil fuels. When fuel prices fell after World War II, interest in wind turbines waned. But when the price of oil skyrocketed in the 1970s, so did worldwide interest in wind turbine generators. The wind turbine technology R&D that followed the oil embargoes of the 1970s refined old ideas and introduced new ways of converting wind energy into useful power. Many of these approaches have been demonstrated in "wind farms" or wind power plants — groups of turbines that feed electricity into the utility grid — in the United States and Europe. Today, the lessons learned from more than a decade of operating wind power plants, along with continuing R&D, have made wind-generated electricity very close in cost to the power from conventional utility generation in some locations. Wind energy is the world's fastest-growing energy source and will power industry, businesses and homes with clean, renewable electricity for many years to come.